Origin:	The Muscatel grapevine family must be the oldest known to humankind that has survived to the present day. It is assumed that it came from the Orient with the Phoenicians, Greeks, and even the Romans, and thus spread across the whole of Europe (Portugal, Spain, France, Germany, etc). Officially, this variety is considered important today in the new world of wine and in France alike. Viala and Valmorel (1905) listed 180 different types of muscatel. The first reference in Iberian literature was made by Alonso de Herrera in 1513. Clemente described this variety in 1807. Chief areas of distribution:	Despite its qualitative superiority, the cultivation of this variety has declined over the last few hundred years, in contrast to the other large berry muscatels described here. In 1914, Garcia de Salomones mentioned this variety as being present in almost all regions. Today, it is grown in the North only; in the North and North-West of Spain and in the Douro region in Portugal at an altitude of between 500 and 700 metres, and in the districts of Favaios, Alijó (at higher altitudes), and Sanfins do Douro. 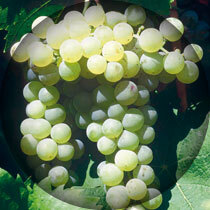 Official synonym(s) (national and OIV):	Muscat à petits grains blancs; Muscat de Frontignan (France). Historic and regional synonyms:	Moscatel Morisco fino de Málaga, Moscatel Castellano, Moscatel común, Moscatel de Jesus, Moscatel branco (Chaves); Moscatel do Douro (Setúbal). Moscatel Amizclero, Moscatel menudo, Moscatel Dorado, Moscatel de la Tierra, Muscat à petits grains, Moscatel Galego, Moscatel Morisco, Moscato Bianco. Homonym(s):	The following have been officially classified: Moscatel Galego Roxo (Nº 200), Moscatel Galego Tinto (Nº 201), Moscatel Graúdo (Nº 202), and Moscatel Nunes (Nº 203). Area under cultivation:	(PT) 500 ha. (ES) 185 ha. New plantings:	Limited new plantings in Favaios, Alijó, Sanfins, and elsewhere (0,44%). Availability of propagating material:	RNSV polyclonal material, and Spanish clones available. Authorized:	Andalusia, Aragon, Asturia, Catalonia, Extremadura, Madrid, Murcia, the Basque Country. DOC quality wine:	Douro, Palmela, Vinho generoso Moscatel. Regional wine:	Trás-os-Montes, Terras do Sado. Young shoot (form of tip):	Open, medium to low anthocyanin colouration, no hairs. Young leaf:	Copper, no hairs on lower side of blade. Young shoot:	Red stripes, anthocyanin colouration on buds. Mature leaf:	Medium size, pentagonal, three lobes, dark green blade, irregular, medium blistering of upper side of blade; reddish main vein at base of petiole, no hairs on lower side of blade, medium even rectilinear teeth, closed V-shaped petiolar sinus, open V-shaped upper lateral sinuses. Bunch:	Medium, conical with wings, dense, peduncle of medium length. Berry:	Round, medium size, yellow green, skin of medium thickness, soft flesh, Muscat taste. Time of bud burst:	Early, 4 days before the Fernão Pires. Flowering:	Early, 2 days before the Fernão Pires. Berry (colour change):	Early, 1 day after the Fernão Pires. Berry (harvest ripe):	Early, at the same time as the Fernão Pires. Rate of multiple bud bursts:	Low. Bud fertility index:	1 = 1.28; 2 = 1.56; 3 = 1.46 flowers per shoot. Yield:	Varies greatly from year to year (by up to 2.5 to 3 kg per vines). (RNSV statistical values: 2.38 kg/vine (Average of at least 40 clones in Tabuaço over 3 years). Yield consistency:	Irregular. Fluctuations in yield have been reduced through clone breeding. Sensitivity to abiotic factors:	None observed. Susceptibility to fungal diseases:	Very susceptible to Oidium and Botrytis; Susceptible to Peronospora; somewhat susceptible to Excoriosis (Phomopsis viticola Sacc.). Systemic viral infection prior to selection:	27% GLRaV-3. 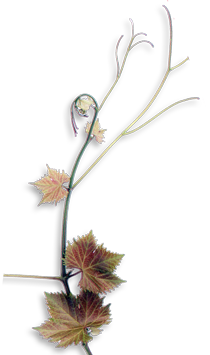 Susceptibility to Pests:	Susceptible to the grapevine moth, somewhat susceptible to the grape berry moth, and some problems with the grape vine louse. Bunch size:	Small to medium. Vineyard conduction system:	Guyot (single and double) recommended, because of low bud fertility. Soil requirement:	Prefers fertile, cool soils. Climatic requirements:	Breezy, sunny locations. Vine density:	Vine spacing: 2.20 x 1.10 m.
Rootstock:	Good affinity with 196-17, and SO4. Irrigation:	Recommended particularly in drought situations. In fertile soils, great care must be taken when irrigating, in order to achieve proper ripening, and to prevent fungal diseases (especially Oidium and Bunch Rot). Incidence of coulure/millerandage:	Highly susceptible to coulure and millerandage. Spoilage of mature berries:	Because it matures early, can become overripe very quickly. Harvest immediately at the onset of rain. Machine harvest suitability:	No experience. Not suitable for terraced vineyards. Wine type:	Table wine, dessert wine. Potential alcohol content:	High. RNSV statistical value: 13.36% vol. (Average of at least 40 clones in Tabuaço over 1 year). Natural acidity of must:	Medium to low. RNSV statistical value: 3.11% vol. (Average of at least 40 clones in Tabuaço over 1 year). Colour intensity of wine:	Strong. Wine colour tonality:	From lemon yellow to brownish. Ageing Potential:	Good capacity for ageing, particularly the dessert wines. Blending recommendation:	with other white varieties of the Douro, such as the Códega, Rabigato, Viosinho, and Gouveio. Wine Descriptors:	The wines reveals a classic muscat aroma of high quality, which sets the variety apart, even when blended with other varieties. The intense taste is balanced, with good acids, but can be overwhelming if the alcohol content is too high.